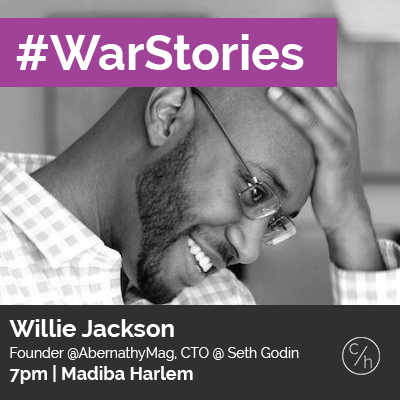 This is “hella short notice” as the kids say, but I’ll be speaking at the Uptown Tech Meetup #WarStories event this evening at Madiba in Harlem, NYC. Every other Tuesday, we’ll be featuring kickass entrepreneurs to join us on the Patio and share their #WarStories. Expect Happy Hour specials all night, great weather, & awesome people! I’m sure we’ll cover my 3+ years in the belly of the beast doing customer support, serving as in-house CTO for Seth Godin, launching/running Abernathy, and of course my signature deadpan wit. A few of people gave me an earful for not personally inviting them to the last event at which I spoke, and I’m still not going to do it this time because that’s an unreasonable expectation, but I feel like I should acknowledge it. I hear and love you, my DearAngryFriends. Events like this are interesting to me because they facilitate the rapid exchange of ideas and candid feedback. I know a lot of entrepreneurs and businesspeople who are a simple perspective-shift away from success, and I love being able to play a role in them seeing things differently. Plus, I love (not having to leave) Harlem (where I live).